Under new head coach Don James, Washington was 11–11 in Moon's first two seasons as a starter, but as a senior in 1977, he led the Huskies to the Pac-8 title and a 27–20 upset win in the Rose Bowl over Michigan. Moon was named the game's Most Valuable Player on the strength of two short touchdown runs and a third-quarter 28-yard touchdown pass to wide receiver Robert "Spider" Gaines. 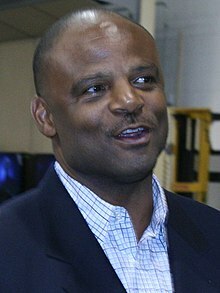 Moon's decision to enter the NFL touched off a bidding war for his services, won by the Houston Oilers, led by Hugh Campbell, his head coach for his first five seasons in Edmonton. Gifford Nielsen—the starting quarterback in 1983—retired after Moon joined the team, stating that Moon becoming the starter was inevitable. 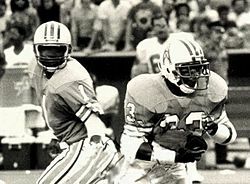 Moon had a difficult adjustment period, but threw for a franchise-record 3,338 yards in his first season in 1984, but Campbell was just 8–22 (.267) at the helm and did not finish the 1985 season. When new head coach Jerry Glanville found ways to best use Moon's strong arm in 1986, the team began having success. In the strike-marred 1987 season, the Oilers posted a 9–6 record, their first winning season since 1980. In his first postseason game in the NFL, Moon passed for 237 yards and a touchdown in the Oilers' 23–20 overtime win over the Seattle Seahawks in the wildcard round of the playoffs.